Using a stand mixer, blend all dry ingredients together. Add the butter, water and eggs to the dry mixture and blend. To make Cake Pops: You will need a cake pop pan (can be found at Bed Bath and Beyond or Amazon.com), and 6-inch sucker sticks and a foam block (like a floral block) to allow pops to cool and set while decorating. Spray pan release on the cake pop pan. Add cake batter to the fill line of each hole. Secure the top of the cake pop pan. Bake for 15 minutes. Remove from oven and let cool 10-15 minutes. Remove the top of the cake pop pan and gently run a butter knife around each cake pop to help release. Set cake pops aside. To make candy coating: Melt a 12 ounce bag of semisweet chocolate chips, and or white chocolate chips in a microwave, stirring often. Add a tablespoon of vegetable oil if coating is too thick after microwaving. Prepare bowls with toppings. 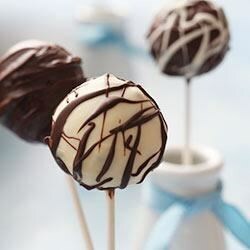 Dip the end of each stick in chocolate coating and press into one end of a cake pop. When all the cake pops have sticks, place them in a freezer for 10-15 minutes to set the chocolate (this will help hold the sticks in place while dipping into additional coating). When pops have chilled, dip each pop in chocolate coating, taking care to seal the chocolate around the base of the stick. Decorate with desired sprinkles and chocolate drizzles. Set each pop into the floral block to let set.